As Jewish communities evolve, old congregations and communal organizations typically lose members and may close down or relocate. But what always remain behind are the cemeteries. 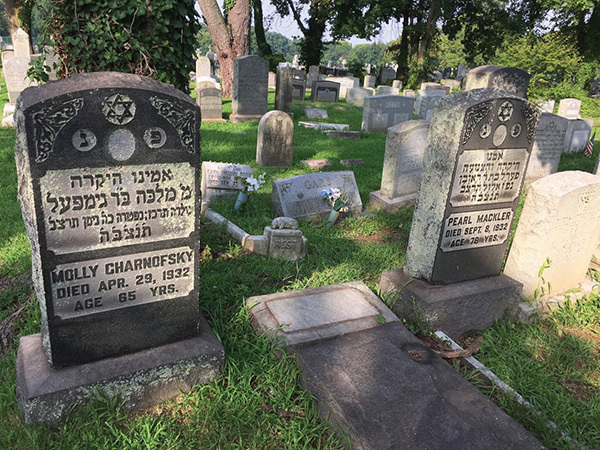 On Pitman Avenue in Hamilton, less than four miles from the State Capitol in Trenton, are five adjacent Jewish cemeteries, where members of some of those old synagogues and organizations are buried — and all those burial grounds are in a state of disrepair. 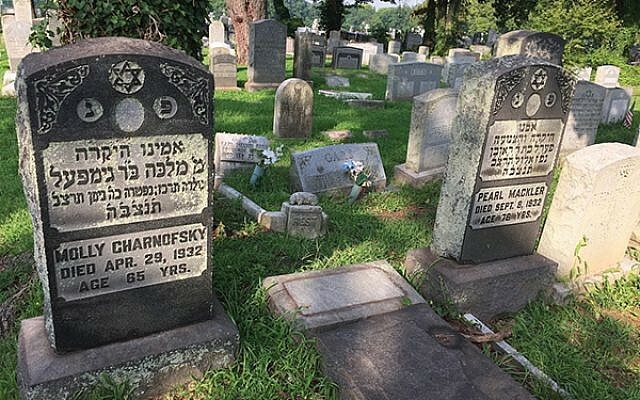 Now, several former city residents have formed the Greater Trenton Jewish Cemetery Project (GTJCP), in partnership with the Jewish Federation of Princeton Mercer Bucks. Their aim: to raise funds and rehabilitate these neglected burial grounds. “The tombstones are falling over, and the graves are collapsing — it is a shanda” (Yiddish for “shame”), said project member Lynne Azarchi, a West Windsor resident. The first step? “We are making it clean, getting rid of the weeds,” she said. In an effort to draw more Jews to their cause, the GTJCP will hold its inaugural event on Thursday, May 2, at 6 p.m. in the offices of Stark & Stark in Lawrenceville. Attendees will hear about the conditions in the cemeteries and the need for restoration and preservation. Presenters will include a national expert on cemetery restoration and a local monument company representative familiar with the Trenton cemeteries who can address the work that will be involved in the project. The organizers’ goal is to raise $250,000 to fix up the cemeteries and another $250,000 as an endowment for perpetual care and repair. 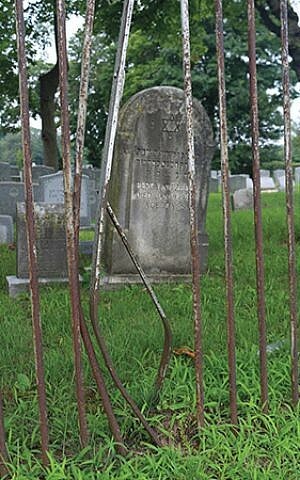 Rehabilitating a cemetery is one of the highest forms of tzedakah, said Steven Sacks-Wilner, a member of Princeton Chabad, “because since the people have already died, you can’t expect any benefit from it.” His maternal grandfather, Rabbi Joseph D. Kaplan, originally of Belarus, was the head of Dr. Herzl’s Zion Hebrew School in Trenton, predecessor of Abrams Hebrew Academy, now in Yardley, Pa.
Sacks-Wilner came to the project after helping to rehabilitate the Chabad Cemetery — transforming it, he said, from “a jungle” to a place that is “beautiful and pristine.” One day he was there and decided to visit nearby family graves. His great-grandfather Rabbi Israel Stein, who came from Minsk, is buried in Anshe Emet Cemetery. His grandfather Louis Nachum Aryeh Leib Wilner, who had a bakery on Fall Street in Trenton, died in the 1918 flu epidemic and is buried in the Workmen’s Circle cemetery. Congregation Beth Chaim member and Trenton native Gary Hofing grew up at Har Sinai Temple. At his mother’s request, he took on the task of caring for his relatives’ graves after his father died. His paternal grandparents, Herman and Sadie (Zoltick) Hofing, as well as his father’s older brother, Robert, are buried in the Anshe Emet Cemetery. His father’s younger brother, Edward, is buried in the Young Judaea Cemetery. His mother’s Zoltick relatives are buried in the orphan cemeteries. Hofing read Finkle’s blog advocating for the repair of the cemeteries and eventually found his way to the project. Princeton resident Albert Stark has family roots in Trenton going back to 1878, when his great-grandfather Samuel Meyer Stark became the city’s first Jewish religious leader. He ministered to nine families — the core of what in 1883 became Brothers of Israel Synagogue. Stark became interested in Trenton’s Jewish cemeteries after his father died in 1994 and his Uncle Amiel began talking to him about his family. Samuel Stark’s wife, Bessie, is buried in the orphan cemetery that was run by the B’rith Sholem Lodge. Another goal is to remove fencing between the five cemeteries and erect new fencing around their perimeter to replace the current damaged barriers. The project has arranged for the photographing of the stones and recording details on them as part of an international effort to chronicle generations of Jews. They plan to use this information for educational projects about Trenton’s history. At the May 2 event, Azarchi said, Finkle will be honored for his work preserving the history of the Trenton Jewish community. “We are thanking him for what he has done to honor our forefathers and foremothers,” she said. “We are here today because of them; we are here because of these people who were so brave, coming to this country with nothing, not speaking the language, having no money” and building homes, families, and community. When: Thursday, May 2, 6 p.m.